This Robinson's house is situated in the middle of a line of pretty cottages. It's an idyllic location. The interior has a number of rooms, each with character. There is also a small outdoor courtyard area, where the only other customer in before me was reading a newspaper. It was very peaceful, with no music or TV. Another couple of guys appeared later. All including the barman seemed friendly. There is a public car park at the rear. Unicorn & Dizzy Blonde are the regular ales. On this visit, they also had Wizard. Absolute cracking pub, olde worldy, great features, small but nice garden to rear, quaint village setting with the very nice Robinsons Dizzy Blonde on aswell. Shame the same cannot be said about it's inhabitants the locals/regulars obviously don't know how rude it is to stare at people, wouldn't go back in a hurry, shame really. At least we were served in here, the pub up the road just looked at us like we'd gatecrashed their private party. 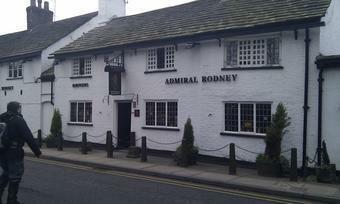 Low beams, smokey rooms, bright fires, friendly Landlord, and above all a well kept pint of Robinsons best.